I saw several 360 cameras for consumers at CES 2017, but the one that I am most excited about is the Kodak Orbit360 4k. Here’s why. In 2016, there were several 360 cameras, but all of them had one or more significant issues. For example the Ricoh Theta S has great photos, but its video resolution is too low. The Samsung Gear 360 has great photos and good videos, but is compatible only with high end Samsung phones, and needs an S7 or a desktop to get the full video quality. 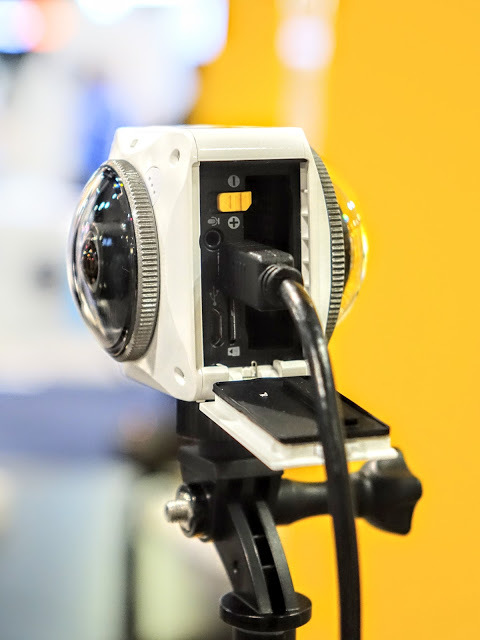 The Nikon Keymission 360 is actionproof and stitches videos in-camera, but it’s soft at edges, and has connectivity issues. Kodak PIXPRO’s own SP360 4k Dual Pro stands out for its video quality but it too has many usability issues. 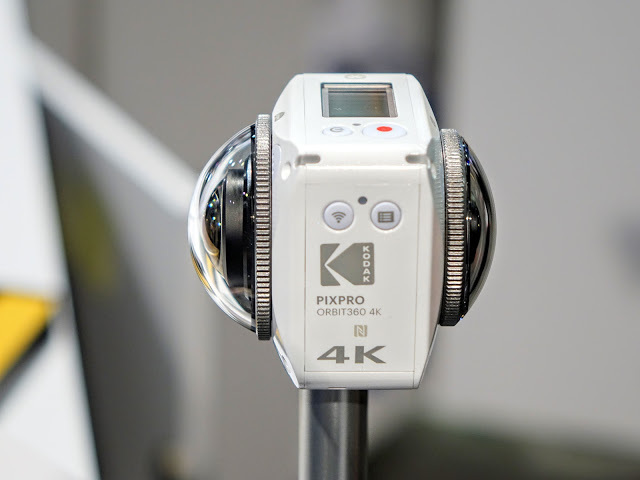 The new Orbit360 4k (formerly called the 4KVR360 — thank goodness for the name change!) is a new intermediate-level 360 camera that seems to check all the boxes. The Orbit360 4k has an unusual design. 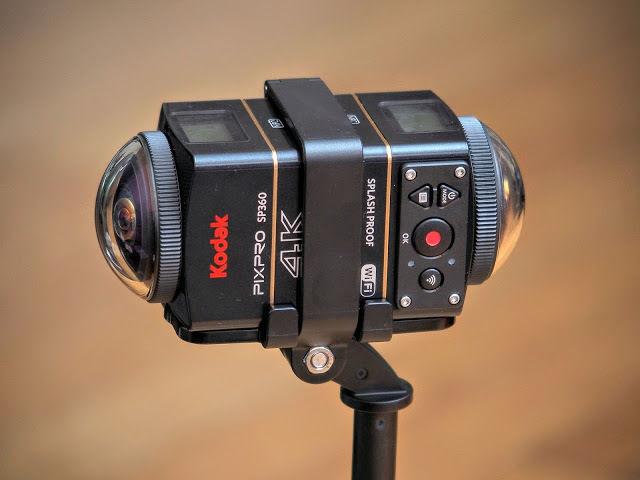 It uses the same lens as the SP360 4k with a 235-degree field of view, then adds a second lens on the opposite side to enable it to be fully spherical. But rather than simply adding another identical lens, it adds a smaller lens, with a 197-degree field of view. The benefit of having a different lens is that it can provide a third view in addition to the hemispherical view and the spherical view. The Orbit360 appears to retain most of the strengths of the SP360 4k. Most importantly, its larger lens is the same high performing lens from the SP360 4k, which I found to have very good edge-to-edge sharpness, and very little chromatic aberration. Its only weakness was a susceptibility to flare, although this can be diminished if you are willing to remove the protective outer cover. Like the SP360 4k, the Orbit360 is splashproof (IPX5), dustproof (IP6X), freezeproof (-10C / 14F) and shockproof (up to 2m with the protective cover). Its lenses also have a replaceable outer element. If the outer element gets scratched, you can just get a replacement for it, rather than having to buy a new camera. I’ve had a couple of 360 cameras that have been scratched even with me being very careful with them, so this is a huge benefit. The Orbit360 4k also has a dedicated wearable remote, just like the SP360 4k. I like having a dedicated remote and not just Wi-Fi control via smartphone because it’s faster to use and has usually been more reliable. – Update: the Orbit360 will have Electronic Image Stabilization (EIS), just like the SP360 4k. However, on the SP360 4k, Kodak advised turning off the EIS when in dual mode (otherwise the stitch would be compromised). In the Orbit360, it appears we’ll be able to use the EIS while shooting spherical 360 video! – Burst mode (10fps), Time Lapse, Loop Recording modes. – Just like the SP360, the included software will enable customizable stitching. For example, if the subjects are primarily close, you can adjust the stitching for close distances. If the subjects are mostly distant landscapes, you can adjust the stitching for farther distances. My understanding is that the SP360 4k’s software will retain these features. – Unstitched files available. You will have access to the unstitched files, which you can stitch with 3rd party software if you prefer. – The included software can adjust the photos and videos for exposure, color, sharpness and other parameters. – Lens caps: That might not seem like a an important feature but in practical terms, it is very helpful. For conventional cameras, a lens cap is a given, but for 360 cameras, most of them don’t include a lens cap, with the exception of the LG 360 Cam (which uses a hard plastic sleeve as a combination cover and handle) and the SP360 4k. The SP360 4k’s lens cap has helped me maintain them in scratch-free condition. BTW in case you’re wondering, the Orbit360 will use the same battery LB-080 as the SP360 4k, so if you have batteries from the SP360 4k, you can use them with the Orbit360. Of course, what we’re most interested in are the improvements over the SP360 4k, and there are many. 1. Size. First of all, the Orbit360 is much more compact than the SP360 4k Dual Pro. If you’ve never had the SP360 4k Dual Pro you might think this is not significant, but it is. There have been many occasions where I was choosing which camera to bring and decided to leave behind the SP360 4k Dual Pro simply because it is too bulky. Besides having two cameras back to back, its bracket had a GoPro style mount which is angled and doesn’t allow the camera pair to stand on its own. I had to bring a stand for it. Even after I added a 1/4-20 tripod adapter, it was still quite bulky. The Orbit360 is approximately the same size as the Nikon Keymission 360 and is relatively easy to carry around. And its 1/4-20 tripod insert makes it easy to use it with most tripods, lightstands and selfie sticks. The SP360 4k used a 1/2.3 inch 12-megapixel BSI CMOS sensor. The Orbit360 4k has a 1/2.3 inch 20-megapixel BSI CMOS sensor for each lens. The Orbit’s sensors are among the highest resolution sensors in an intermediate or entry level 360 camera, and I’m relieved that it’s still BSI (which has better light sensitivity than non-BSI sensors). The SP360 4k Dual Pro cameras were often out of sync, even with the remote which was designed to trigger both cameras simultaneously. More importantly, the white balance and even the exposure were sometimes different between each camera, which made the halves of the image sometimes look different. The Orbit360 appears to have fully synchronized genlocked lenses. When I saw the livestream from the Orbit360, I could not see any sign that the two lenses were anything but fully synchronized. Moreover, their color and exposure appeared identical. 3. Accessible battery, memory card, HDMI and USB while using a tripod. When the SP360 4k cameras are used with their bracket, you could not access the battery, memory card, or USB. And BTW, to remove the cameras from the bracket, you needed to use a coin (or screwdriver). An improved base mount allowed access to the USB and memory card, but not the battery. Moreover, the cover for the USB and memory card could not be closed if you opened them. Fortunately, Kodak PIXPRO listened to its customers. 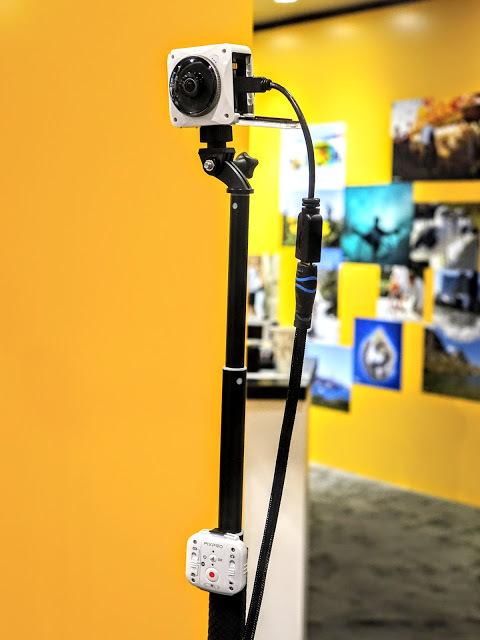 The Orbit360 allows access to the battery, USB, HDMI, and Micro SD memory card slots while mounted to a tripod. Finally! Due to the smaller distance between lenses, the Orbit360 is less susceptible to stitching errors from parallax. See this related post for a video demo of the Orbit360’s stitching. The Orbit360 has a 2.5mm stereo input jack for an external microphone — one of the very few entry level to intermediate 360 cameras to have such an input jack. 6. Micro SD up to 128GB. Yes the 20mp sensors are going to produce larger files, but fortunately, the Orbit360 has a higher memory capacity. The SP360 4k was limited to Micro SD cards up to 32GB. The Orbit360 accepts Micro SD cards up to 128GB. The SP360 4k had a nonbacklit LCD which was hard to read in low light. The Orbit360’s LCD display is backlit. According to its specs, the Orbit360 supports RAW format. I don’t know if this simply means that it can provide unstitched files, or if the files are truly in unprocessed RAW format. If they are, that would be a big deal because no other entry-level or intermediate camera has this feature. Photographers love using RAW because it gives them higher image quality, and better control and flexibility in making adjustments. As I mentioned, the asymmetric design of the Orbit360 provides users with different perspectives to choose from: fully spherical, hemispherical 235 degrees, 155 degree circular fisheye, or 197 degrees rectilinear fisheye. This is useful for shooters who want a variety of shots. 10. Update: High speed video. Just like the SP360 4k, the Orbit360 will have 120fps high speed video (for super slow motion). However, whereas the SP360 4k high speed mode was limited to 1280 x 720 @ 120fps (16:9 format), the Orbit360 can record a high-speed 360-degree video (1440 x 720 @ 120fps). And yes, the Orbit360 can also do 1280 x 720 fps with its small lens. The Orbit360 offers excellent value. 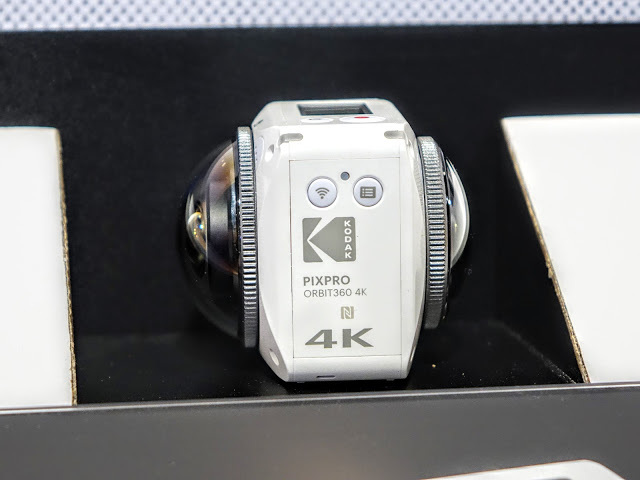 It has the same lens as the SP360 4k with a better sensor, and adds a second lens and sensor, yet costs only the same as a single SP360 4k camera. With all these improvements, you can understand why I’m excited about the Orbit360 and why I ordered it even without having seen the photos and videos. While the Orbit360 looks fantastic, there are plenty of unknowns. Like I mentioned, the livestream from the large HD monitors looked great. But of course, that is hardly a torture test. I don’t know how the image quality looks when viewed up close. Until we see it closely, we won’t know for sure how it compares to the SP360 4k Dual Pro, the Nikon Keymission 360, or Samsung Gear 360. One of the issues with the SP360 4k was that it didn’t have a self-timer. I really hope the Orbit360 has a self-timer function that is usable without the app. The SP360 4k had limited control over exposure. You could only select exposure compensation. It looks like the Orbit360 has smiliarly limited control, but I’m still hoping that they will add it. Similarly, I don’t know what is the slowest shutter speed for the Orbit360. I hope it is slow enough for night sky photos, but I haven’t seen anything that indicates this. The SP360 4k was susceptible to overheating and could not record for more than 25 minutes or so (sometimes less). I am a little worried the Orbit360 may be even worse because it has a small body and two sensors. But perhaps it might be better…? Since the Orbit360 now allows access to the USB port while attached to the tripod, it would be nice if you could attach it to an external powerbank, and who knows, it may even allow it to heat up more slowly and last longer before shutting down. At CES, they showed an Orbit360 that was streaming to a large LCD TV. 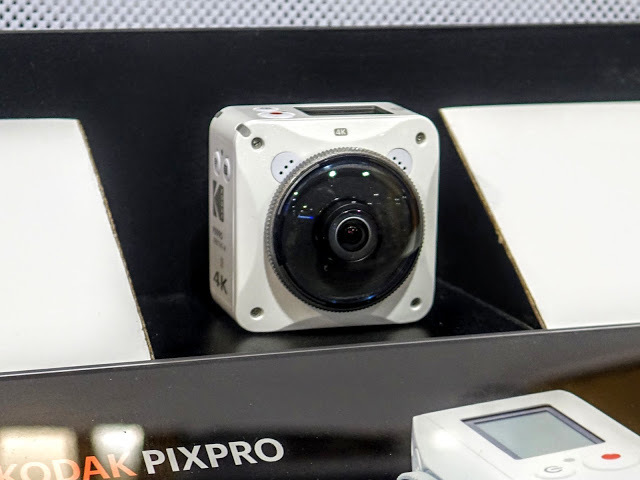 I wonder if it’s possible for the Orbit360 to be livestreamed, perhaps not in the same way as the Insta360 Nano, but hopefully like the Ricoh Theta S (via USB or HDMI). However, so far I have not seen anything even mentioning this, which I would think they would have if it were possible. The remote for the SP360 4k used older RF technology but it could trigger up to 5 cameras simultaneously. The new remote looks identical to the old one but it uses Bluetooth (BLE 4.1). Can it trigger more than one camera or is it limited to one camera? You can see the new remote, which looks like the old one but uses Bluetooth. In-camera stitching at 4k is limited to 15fps, which has limited usefulness (maybe a little planet video or a stop motion video 🙂 ). Instead, to get 24fps, you need to stitch on a desktop. This is a limitation of the camera’s processor. However, wouldn’t it be great if the Orbit360 app could stitch the video at 24fps? That would be very useful.So as you can see the Orbit360 is an exciting camera but there are still many questions about it. How about you? What do you think about the Orbit360? Do you have any questions about it? Pls. post in the comments and I’ll try to relay them to Kodak PIXPRO and dig out the answers. BTW, if you’re interested in the Orbit360, check out the Orbit360 Users Group on Facebook. I’ll be posting all Orbit360-related info there. You mentioned about removing the protective lens covers on the Kodak and it reducing flare so was just wondering: have you tried shooting without the protective lens covers on the Keymission and if so did you detect any noticeable difference in image quality? Hi S Riley! I tried removing the lens covers on the KM just to see if it would improve the stitch (it didn't) but I am supposing it should improve flare resistance. I will post test shots. Thanks! Yes usually the more elements, the greater the likelihood of flare. What I'm not 100% certain about is whether the outer element is a diopter that is required for optimal image quality or not. I will check! I may have missed it if it was mentioned, but does it have horizon stabilization? Hi Richard. Yes it will have some type of horizon stabilization. It has built-in sensors and is claimed to have EIS but I have no idea how effective it is. Thanks. Would love to see images/video direct comparison of this against the keymission. Thanks Richard. I will definitely post a comparison if / when it is released. Also, is it capable of surround sound? Hi! When stitched on the desktop, the 4k framerate is 24fps. When stitched in-camera, it is 15 fps. When will this 360 cam be available? Thanks for your review. I bought the duo pack about a year ago no problems with overheating and I have shot for the full 55 minutes for two concerts and a history lecture with Tycho and Kepler. Just hemispherical video as I am shooting for a planetarium. I just bought another duo pack so I can do events with four cameras. Looks like I will get this one too. Just not thrilled by shooting the floor and the ground. Using Vegas Pro 14 to edit and render. Hi Rupert! Wow you were able to record for 55 minutes? My SP360s stop at around 25 minutes. I wonder if it's because of additional heat when they're used back to back. Don't worry about shooting the floor. The Orbit360 can be used in hemispherical mode. any idea if they will have a waterproof housing? Does anyone have a release date? I'm headed to Africa at the end of May and was hoping to bring a VR cam to capture footage. This sounds like it would fit the bill nicely. Thank you for the review. What's the best tripod recommended for it? 1. For live streaming. Key features is live stitching and ability to deliver video stream. 2. For recording. It is better to record with best possible quality and then stitch with best possible quality on PC. In that case it will also eat less battery while recording and camera will last longer.